Many people believe that a powerful spirit made the world and everything in it. When people pray they ask this spirit for help and love. Groups of people share what they believe. These groups are called religions. There are different groups and different ways of believing. The name of one religion is Judaism. People who follow it are Jews. Their holy book is the Torah. Judaism (say joo-day-ism) has one God. When inside a synagogue, men and boys wear a small cap called a yamulka and generally wear a shawl when they pray in the synagogue or elsewhere. The yamulka reminds them that God is above them. The person in charge of a synagogue is a rabbi (say rab-eye), a person who conducts services and advises and teaches members of the Jewish community. A rabbi is a scholar as well as a spiritual leader, and is therefore able to settle questions about the faith that people may have. Judaism is the oldest of the major world religions that believe in one god. The Jewish calendar starts on the day the Jews believe God created Adam and Eve, so 2019 is the year 5779 on the Jewish calendar. The sacred text of Judaism is the Torah. 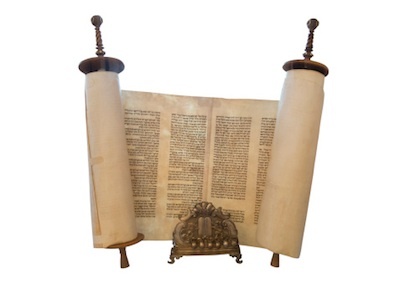 The Torah contains the laws of Judaism and was given to the Jewish people by the prophet Moses. A prophet is a holy person who tells others what God has said. For Jewish people, the most sacred day of the week is the Sabbath, or Shabbat. This day is from sunset on Friday until sunset on Saturday. Shabbat is a reminder that God created the world in six days and rested on the seventh. So between sunset on Friday and sunset on Saturday, Jewish people do not work but go to pray at the synagogue. At sunset on Friday, the family gathers and shares a special ceremony before the evening meal. Two candles are lit, wine is blessed and bread is blessed, thanks are given. Passover is a major eight day festival and celebrates the time, thousands of years ago, when Moses led the Jewish people out of Egypt where they had been slaves. Rosh Hashanah is the Jewish New Year, celebrated over two days by some people. It is a time of family celebrations and special foods. One ancient custom is to eat apples dipped in honey as a way of wishing for sweetness in the coming year. The first part of a prayer is said, then a bite is taken of a slice of apple that has been dipped in honey, and then the second part of the prayer is said. On the first day of Rosh Hashanah, people perform tashlikh or tashlich. They go somewhere where there is moving water, such as the sea, a river or stream. They think about all the things they did wrong in the past year and cast away these sins as they say the first part of a prayer. They throw crumbs or chunks of bread into the water and watch the bread being swept away, representing the washing away of sins. They second part of the prayer is now said, promising to be good in the coming year. At Hanukkah the candles on a candleholder called a menorah are lit in a particular way. The menorah is lit for eight nights in a row and a feast enjoyed. Hanukkah celebrates a time after a battle to win back Israel from invaders. The temple was re-dedicated. There was only one container of oil left by the defeated invaders, but it miraculously kept the temple lamps lit for eight nights. Jewish people follow very strict ancient laws called Kosher laws, about what they can eat. Only certain types of meat can be eaten - the meat from animals with cloven (split) hooves who chew cud. If an animal has or does just one, such as a pig which has cloven hooves but does not chew cud, or a camel which chews cud but doesn't have split hooves, then that animal cannot be eaten. Animals must be killed painlessly and very fast so they don't suffer pain. Goose, duck, chicken and turkey are the only birds that can be eaten, and theirs are the only eggs that can be eaten. Only dairy products from kosher animals can be eaten, and cheese must be free of animal fats. Meat and dairy cannot be combined: they are eaten separately. In fact, different crockery is used for meat and dairy. There must be a number of hours between eating meat and dairy. Only fish with fins and scales can be eaten; shellfish cannot be eaten. There are laws about planting of fruits and vegetables, but all plants that grow in the soil or on trees and bushes may be eaten as long as they are carefully washed to remove any insects. Native American: live in harmony, for we are all related.